Most men approaching 50 years old look at it as a milestone of sorts – the onset of what is commonly known as middle age. That wasn’t the case for Dennis Meitl in 2006, however. Instead, he saw his upcoming entrance into the targeted group for AARP membership solicitations as the ideal opportunity to give himself a much deserved birthday present. “I had hunted for many years but had never gone on a guided hunt. My cabinet-making business had done well, so I decided to spend some of the profits and treat myself to a guided Colorado elk hunt,” he said. To that end, the Colby, Kan. resident contacted Atkinson Expeditions, based in Wellington, Colo.
“I had heard good things about Wes Atkinson’s operation from friends who had hunted either elk or deer with him in the past. They were all happy with his services and with the quantity and quality of the game they saw or killed. Plus, he took care of getting their licenses for them. So for me, choosing him to provide my birthday present was a no-brainer. I called Wes and booked a September archery hunt. ” Meitl said. Atkinson conducts his operations on private ranches in both Wyoming and Colorado. “We have about 10,000 acres of prime habitat near Fort Collins that has good numbers of elk and mule deer, and every year we manage to kill some good trophies of both species. It’s not unusual to see a herd of 100 or more elk, with several shooter bulls among them. If a person is a decent shot with a bow or gun, he’ll hang a tag on a good bull. That’s why we have a success rate of close to a 100 percent. Also, because we’re hunting a private land, getting a license through the public draw is fairly easy. In fact, once someone books a hunt with me, I take care of all the paper work,” Atkinson said. Meitl arrived in Colorado the day before his hunt began and checked into a Wellington motel. That evening, Atkinson and another hunter he was guiding came to Meitl’s room. “The other hunter wanted to kill a really nice bull. As a result, they had passed on several small ones or didn’t get on to one of the big ones they had seen. And that’s pretty much how it went when we went out together the next day. We saw many elk, including a few decent bulls, but none of the setups worked out for him. At one point, he had a small herd with a respectable bull in it walk right behind him. Wes and I were watching from about 100 yards away, and it appeared as if the elk were less than 15 yards from him as they passed by. As it turned out, he was too far below them with some heavy brush in between the bull and him. He would have had to reposition himself and probably would have spooked the elk. So he never had a chance for a shot. Although he went home empty handed, his wife managed to stick an arrow into a nice pronghorn later that day. All in all, it was a pretty exciting day even though I didn’t get to hunt,” Meitl said. Wes Atkinson and Atkinson Expeditions is a Bowsite.com Sponsor and offers archery, muzzleloader and centerfire rifle hunts for trophy elk and mule deer. He also conducts less expensive management hunts for both species. Now it was Meitl’s turn. “After being out with Wes and the other hunter that day, I sort of figured out the routine. The elk feed in the alfalfa fields during the night and then as it starts getting light, they move up into the surrounding hills to bed for the day. The task was figuring out the routes they would take or finding them in their bedding areas. “I quickly realized Wes had done his homework and how good he was at finding elk with his binoculars, too. It was almost uncanny in fact. Even after he pointed and exactly described their location, I often couldn’t find them. No doubt having hunted elk for most of his life had helped him hone his ability to glass. He also knows the ranch well, thus pretty much could predict how the animals would react and where they would move when pressured. “The rut was on, but the bulls weren’t calling much when I had been out with the other bowhunter. 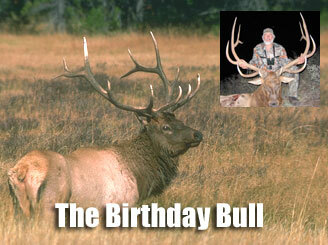 Then Wes and I heard one good bugle on the morning of the second day and finally saw the bull. Wes said he was a shooter. Hoping the bull and his cow would pass below, we rushed to the top of a ridge and tried to guess where the elk would pass us. Two smaller bulls came within 15 feet of me and were so close that we could hear them munching on the grass as they grazed along. I stayed still and waited for the bigger bull to move into my shooting lane. Unfortunately, he had never showed himself. We saw a couple other bulls that day but could never get into position for a decent setup. “On the morning of the third day, it was very quiet – no bugles at all. We planned to ambush a bull as he moved to his bedding area after gorging himself on alfalfa. Right at daybreak, we saw elk heading over one of the ridges. At least two good bulls were among them. Wes said we had to move fast if we wanted to head them off. So here we were doing double time across these open fields in a half-crouched over position. At that point, I was wishing I had booked a rifle hunt. Wes is all high-energy when he walks, and I move more like the 250-lb. lumber wagon that I am. Alas, the forced march didn’t work either,” Meitl said. “When we didn’t catch up with those elk, I decided to outsmart them go to Plan B. I had a good idea where they were bedding and planned to get there before they moved that evening. If everything went as I hoped it would, we could call one of the bulls to us,” Atkinson said. That afternoon the men worked their way around the mountain from the other side backside and set up on the west side of a ridge. If Atkinson’s hunch was correct, the elk were bedded on the east side, within 100 yards or so. “We got to our spot in plenty of time but decided to wait a bit before making our next move. We sat, talked a while and just enjoyed mountain air. When we got up and began walking, we hadn’t gone more than 40 yards when a bull busted from the nearby cover. Wes figured he had been lying there and listening to us the whole time. “We worked our way around the edge of the ridge, then started back the other way. As we neared the elk’s bedding area, we could hear them talking big time. I thought to myself, ‘This is good. The wind is in our favor, the elk are talking and they’re right over the ridge.’ As we started to formulate a plan, we looked up the ridge and spotted the antlers of good bull, He was standing behind a tree about 150 yards away and apparently had no idea we were there,” Meitl said. Atkinson wanted to call the bull in for a shot. He told Meitl to get in position behind some brush and quickly moved about ten yards behind the hunter. The calling was unnecessary, however. As the men watched, the bull began moving toward them on his own. “I couldn’t believe it when I saw the bull lumbering his way down the hill. I had already nocked an arrow and pretty much mapped out the route the bull would take. I figured he would come to a certain tree and then turn left into an opening where I would have a shot. I pulled out my rangefinder and aimed it at the tree. It read 50 yards. It was perfect. I had practiced shooting quite a bit and knew I could make the shot at that distance. “As the bull reached the opening, Wes stopped him with a cow call, and I put an arrow behind the bull’s shoulder. He took off and ran maybe 100 yards before falling in a small cut,” Meitl said. Although the bull had a short point coming off one eye guard, it was a typical 6x6 and gross scored 354 B&C points. And for Dennis Meitl, his 50th birthday party was the best one ever. 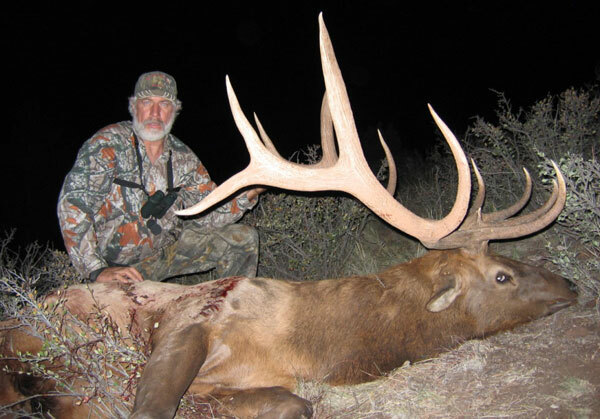 Dennis Meitl's bull shot with Atkinson Expeditions grossed 354. This was one heck of a Birthday present! Tony Mandile is an outdoor writer and one of the first pioneers of hunting information on the Internet through Compuserve. He lives in Glendale Arizona. Pat Lefemine from Bowsite.com will be broacasting a Live Hunt from Atkinson Expeditions this coming September. Look for it to start August 31st.